When I made these cookies as a special treat for my coworkers, my roommate walked into the kitchen and exclaimed, "It smells like fall in here!" Then she took a bite of one and said, "They're the perfect combination of soft and chewy." I'm not sure I need to say anything more. 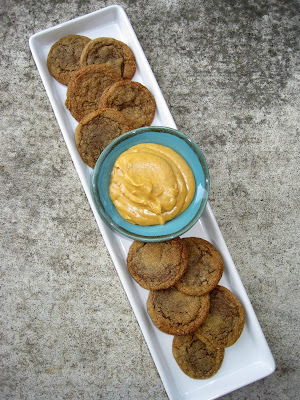 Chewy gingerbread cookie + pumpkin cream cheese dip = success. In a large mixing bowl, cream the butter and sugar. Add the eggs, one at a time, beating well after each addition. Add the molasses; mix well. In a second bowl, whisk together the flour, baking soda, cinnamon, ginger, cloves, and salt. Add to the creamed mixture and mix well. Chill overnight. Shape into 1/2 inch balls and roll in sugar. Place 2 inches apart on an ungreased baking sheet. Bake for 6 mintues or until the edges begin to brown. Cool for 2 mintues before removing to a wire rack. For the dip, beat the cream cheese in a mixing bowl until smooth. Add the pumpkin, mixing well. Add the sugar, cinnamon, and ginger, beating until smooth. Serve with the cookies, storing any leftover dip in the refrigerator. I live in Japan and I know what canned pumpkin is but what is canned pumpkin pie mix? Do you mean just canned puréed pumpkin or something with spices in it already? I second Pamela. Libby's OK? Also, how do you think this would work out with whole wheat flour? I'm thinking they'd likely be a bit more dense -- which fits with fall, anyhow. What's your experience with using whole wheat in cookies?